Keep hydrated and stay stylish at the same time! 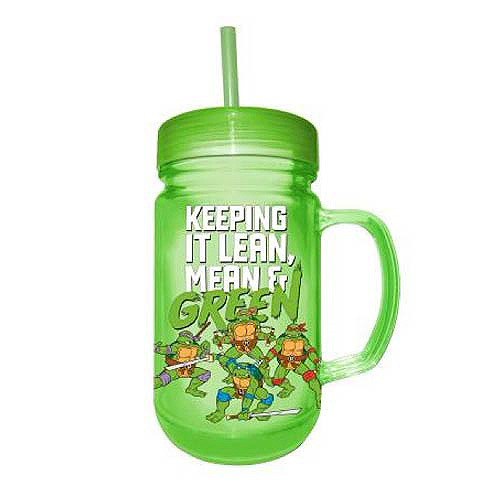 This Teenage Mutant Ninja Turtles Lean, Mean, and Green 24 oz. Plastic Mason Jar features a fun image of Michelangelo, Donatello, Leonardo, and Raphael beneath the words, "Keeping it mean, lean & green!" Fans of the hit Teenage Mutant Ninja Turtles series will love this great mason jar, which features a handle, and includes twist-off lid with straw. Holds up to 24 ounces. Hand wash only. Not dishwasher safe. Do not microwave. Measures 7-inches tall.